Featuring Laura Stack, Dianna Booher, Liv Montgomery, Jeff Davidson, Mandi Stanley, Dawn Jones & more. Do you have a story waiting to be told but know your writing skills need improvement? This expert resource will help you develop both your technical and creative writing skills. 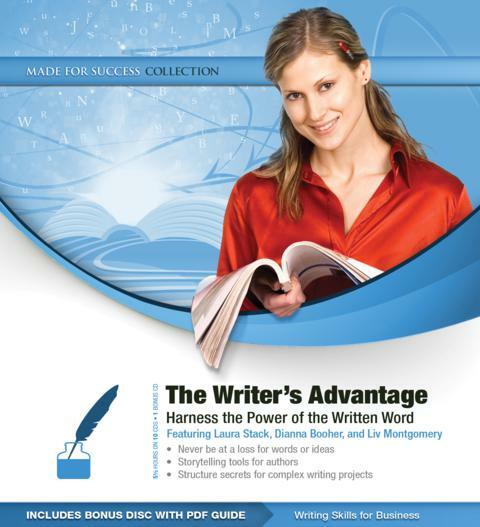 Bestselling authors reveal entertaining and informative methods to craft a story, organize complex thoughts, and write effectively to engage your readers. How to effectively write a book, essay, or business plan does not need to be a mystery. Learn a foolproof system for taking highly complex ideas and plots and organizing them into a cohesive flow that is easy for readers to digest. Let Dianna Booher, author of over forty books, share her insights on transferring ideas from your head onto paper. You will understand the psychology of the written word from the perspective of psychologist Dr. Larry Iverson and gain insights from bestselling author Laura Stack, The Productivity Pro, on how to turn a complex writing project into a manageable task within your normal workday. Get this audio CD collection today to instantly boost your effectiveness in writing the English language. There is no better value in the marketplace for a 10 audio CD collection of expert advice on improving your skills with the written word. The product ships complete with a bonus PDF workbook. LAURA STACK is a personal productivity expert, bestselling author of four books, and a professional speaker whose mission is to build high-performance productivity cultures in organizations by creating Maximum Results in Minimum Time®. She is the president of The Productivity Pro®, Inc., a time management training firm specializing in productivity improvement in high-stress organizations and the 2011-2012 President of the National Speakers Association. Since 1992, Laura has presented keynotes and seminars on improving output, lowering stress, and saving time in today’s workplaces. Laura has been featured on the CBS Early Show, CNN, and the New York Times; her clients include Wal-Mart, Starbucks, Cisco Systems, and Bank of America.DIANNA BOOHER is the prolific author of forty-five books, published in twenty-three countries and sixteen languages, including Creating Personal Presence: Look, Talk, Think, and Act Like a Leader and The Voice of Authority: 10 Communication Strategies Every Leader Needs to Know. Successful Meetings magazine has named her one of the “21 Top Speakers for the 21st Century.” Booher Consultants, Inc. offers communication training: oral, written, interpersonal, and organizational. Clients include 227 of the Fortune 500. Laugh while you learn! LIV MONTGOMERY takes a fun, entertaining approach to communication, mind power, and motivation for today’s busy business person. By distilling the magic of multiple disciplines into what she calls Edutainment, Liv has spent more than a decade developing the proprietary training methods she uses to produce quantum results with her clients in business and life. Liv’s background in big-time marketing and media production—combined with her experience as a certified life coach, hypnotherapist, and NLP practitioner—creates a unique chemistry that’s like rocket fuel for the mind.